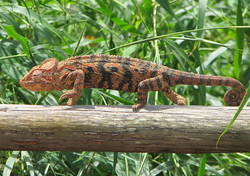 Jackson's Chameleons are a mid-sized species of chameleons often recognized by the three horns that males have though they are absent from females. Similar to most other chameleons, Jackson's Chameleons are more of a display animal and do not deal well with handling. For this reason, they do not tend to make good pets for young children who may want to pick them up and interact with them. Jackson's Chameleon care sheet from FL Chams. Detailed Jackson's Chameleon care sheet includes detailed dietary and supplement information. A non-profit organization based in Southern California that focuses on helping hobbyists with resources and ideas for improving chameleon care. Article with pictures describing Vitamin A deficiency in chameleons.